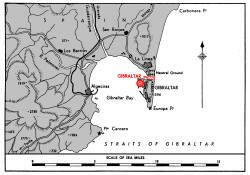 RAF station North Front transferred to Admiralty 26 September 1940 as R.N.A.S Gibraltar but returned to RAF 01 August 1941. Status changed to R.N. Air Section, lodger facilities retained. Commander D. Mc. I. Russell ? 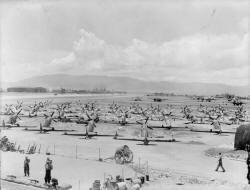 Accommodation for a limited number of disembarked Front-Line Aircraft. 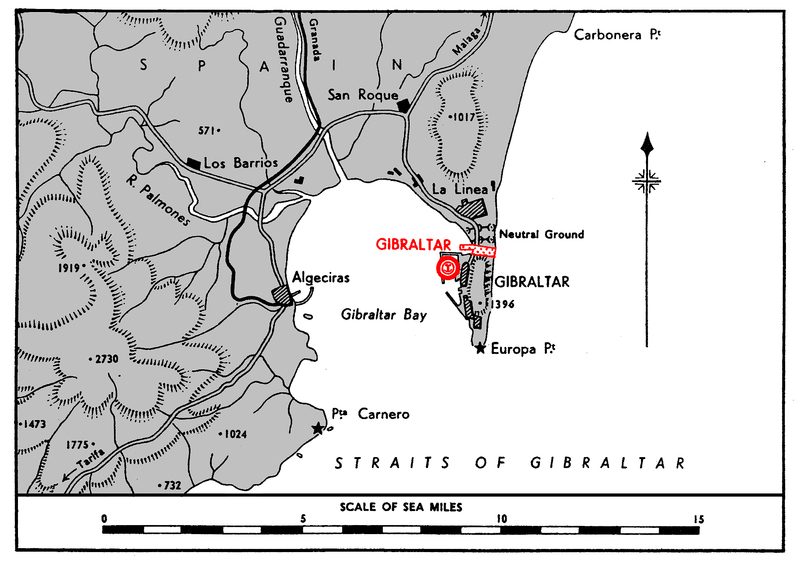 The airfield lies at North Front, that part of the Isthmus joining Gibraltar with the mainland of Spain which lies at the northern foot of the Rock. The Neutral Ground lies immediately N., with La Linea on its far side, distant I mile. 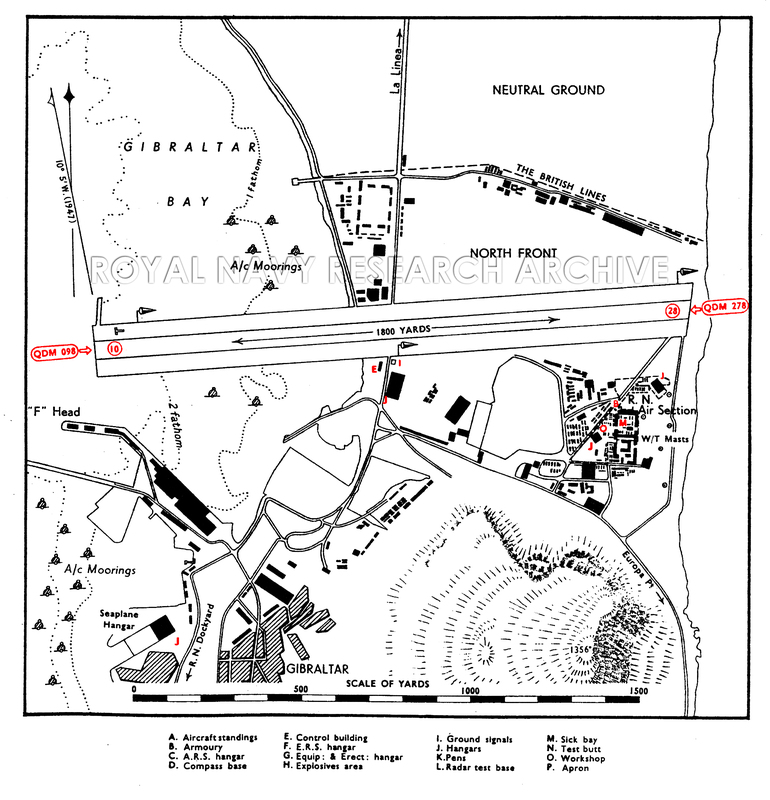 Main road to Gibraltar town and the R.N. Dockyard, distant one mile (R). All shipping facilities at the R.N. Dockyard. Control Building on S. side of runway near the shore of Gibraltar Bay. Caution: In S. winds there is considerable turbulence near the face of the Rock, and in high winds at the ends of the runway, i.e. over the water. During the hot season up currents are found over the ends of the runways. A slow engine-assisted approach is recommended. One. An asphalt runway has been built across North Front and extends westward for about 600 yds. into Gibraltar bay. The total width of this asphalt strip is 150 yds., of which the centre 50 yd,., narked by white dotted lines, is the landing area. 10/28 QDM. 098° -278° .... 1,800 x 50 yds. The two 50 yd. side strips on either side of the marked runway ore in use on taxi .trips. Sierra Carbomera (1,017 ft.) distant 3½ mile. N.
The north face of the Rock, rising to a summit of 1,396 ft., 1,000 yds S. of the ruway. Shipping nay be anchored in the immediate approach to the "10" end of the runway. 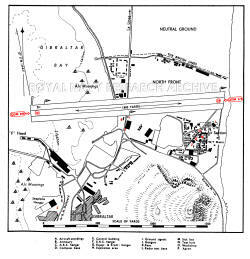 Any approach except from N. or S.
Windsocks al either end of the runway on the N. side and on the S. side near the Control Building. Wind ‘T’ (lit at night) on the N. side of the runway at the "10" end and on the S. aide (unlit) at the "28" end. Air light – Gp.FL.R. at Europa point 2½ miles S. Flashes letters "GR"4 times every minute. Totem poles and angle of approach indicators. Double electric flare-path. Light buoy (fixed white) 1,000 yds. 038° (mag.) from "28" end of runway. Note In addition to the visual approach aids by night shown above, the 6 W/T. 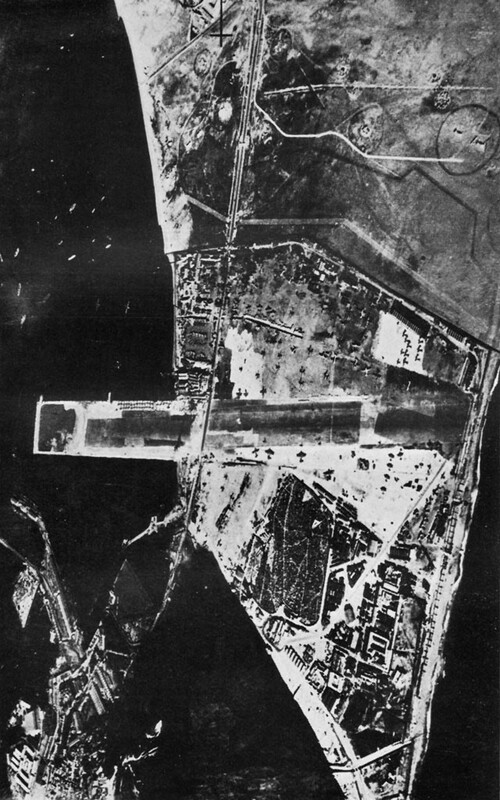 masts close S. of the “28” end of the runway are lit by red obstruction lights. 2 searchlights mark the extremities of the Rook when cloud is below 1,200. or visibility below 4 miles. Living quarters in the N.A.A. camp in the SE. corner of the airfield. One, NE. corner of runway. Diameter 60'. On the open ground S. of the runway, and immediately N. of the N.A.A. camp buildings. There is a large parking area on the N. side of the eastern half of the runway. Sick Bay in R.A.F. camp. Easterly and Westerly winds alternate in spells of a few days. Levantes blow mostly from the E. though they may blow occasionally from the N.E. The Westerly winds (Ponientes) are more variable in direction than the easterlies. In summer the easterlies are usually light and moderate accompanied by fair weather. In winter and early spring they may be strong and squally and accompanied by low cloud and rain. During moderate and strong winds there are violent and confused wind eddies on the lee of the Rock and great care should be exercised. Nearly all the rain falls between October and April. July and August are often rainless. 87, 100 and 130 octane. All normal grades from R.A.F. sources. None. Radar workshop near Flying Control. Off E. end of runway, seawards. Naval aircraft to Naval Section. Target can be towed from Dockyard to a suitable position. Air-to-Air and Sea firing ranges available. Equipped with 6 Walrus aircraft. Formed here 26.05.1943. Operated detachments at Tafaraoui, and Blida. Moved to TaKali 01.11.1944. Equipped with Defiant TT.1, Hurricane IIc, and Swordfish I. Equipped with Defiant TT.1, and Swordfish I.
Disembarked from H.M.S. INDEFATIGABLE 07.02.1951. Moved to RNAS Lee-on-Solent25.04.51. Equipped with 1 Anson and 1 Firefly 5. Moved here from RAF Watton 31.01.1957. Returned to RAF Watton 28.02.1957. Disembarked from H.M.S. THESEUS 05.02.1949. Embarked in H.M.S. IMPLACABLE 18.03.1949. Moved here from RNAS Lee-on-Solent 03.02.1950. Embarked in H.M.S. IMPLACABLE and H.M.S. VENGEANCE 31.03.1950. Returned to RNAS Lee-on-Solent 30.03.1950. Moved here from RNAS Lee-on-Solent 14.09.1950. Returned to RNAS Lee-on-Solent 27.11.1950. Equipped with Martinet TT.1, Sea Fury FB.11, Seafire F.15, Mosquito FB.VI. Equipped with Beaufighter X, Defiant TT.1, Martinet TT.1, Hurricane, and Seafire IIc. Formed here 01.10.1941. 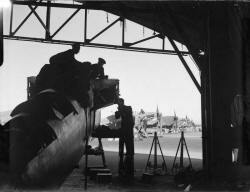 Operated detachments at Taranto, Tafaraoui, Oujda, Blida, Maoson Blanche and La Senia. Disbanded here 05.08.1945. Detachment disembarked from H.M.S. ARK ROYAL 17.01-06.02.1041 and 23-24.03.1941. Equipped with 9 Fulmar Is. Detachment (6) disembarked from H.M.S. ARGUS 07-10.06.1942. Disembarked from H.M.S. EAGLE 22.06.1942. 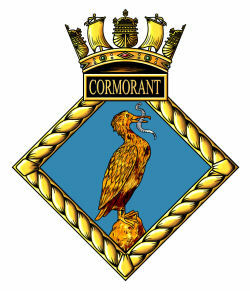 6 a/c re-embarked on 12.07.1942, EAGLE was sunk 11.08.42 and squadron ceased to exist. Detachment (6) disembarked from H.M.S. FURIOUS 25-30.10.1942. Detachment (?) disembarked from H.M.S. FURIOUS 10-15.11.1942. Detachment (9) disembarked from H.M.S. FURIOUS 05-30.01.1943. 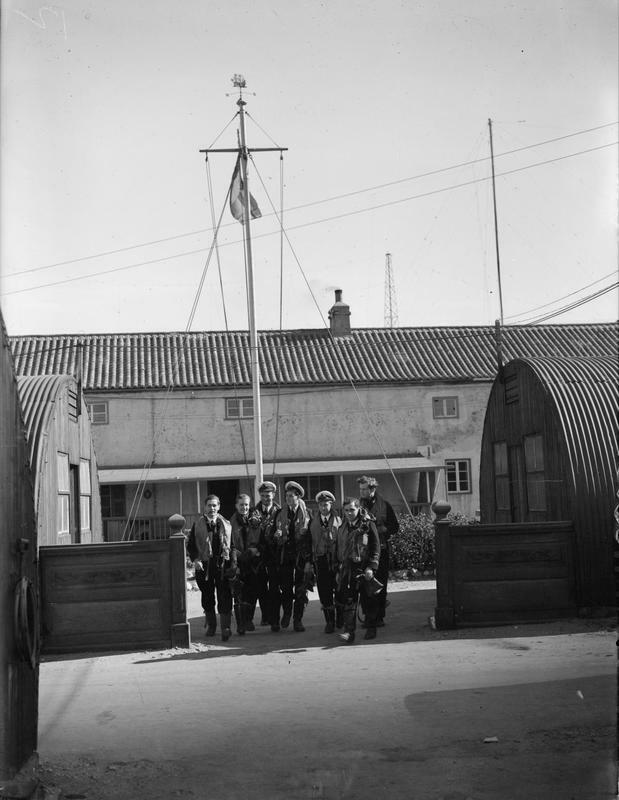 Detachment (5) disembarked from H.M.S. INDOMITABLE 12-27.11.1951. 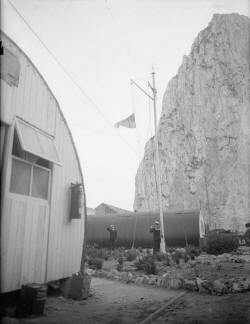 Detachment (3) disembarked from H.M.S. INVINCIBLE 16-19.10.1984. Detachment (6) disembarked from H.M.S. ARK ROYAL 19-25.10.1990. Equipped with 9 Sea Hurricane Ib (EAGLE). Equipped with 12 Seafire Ib (FURIOUS). Equipped with 12 Sea Fury FB.11 (INDOMITABLE). Disembarked from H.M.S. THESEUS 05.02.1949. 25-31.01.1952. Disembarked from H.M.S. ARK ROYAL 09.02.1957. Embarked in H.M.S. ALBION 28.02.1957. Disembarked from H.M.S. EAGLE 15-30.10.1958. Disembarked from H.M.S. EAGLE 03.02.1959 Moved top RNAS Hal Far 06.02.1959. Detachment (2) disembarked from H.M.S. EAGLE 02-13.03.1959. 'A' Flight arrived from RNAS Belfast 8.09.1941. Embarked in H.M.S. 14.10.41. Detachment (?) disembarked from H.M.S. ARGUS 08.10.1941-02.06.1942. Disembarked from H.M.S. ARGUS 10.08.1942, embarked in H.M.S. FURIOUS 13.10.42. Equipped with Sra Hurricane (various marks). Equipped with Sea Hawk FGA.4 (EAGLE). Detachment (?) disembarked from H.M.S. OCEAN 15.07-01.08.1946. Disembarked from H.M.S. EAGLE 03-13.08.1959. Disembarked from H.M.S. ARK ROYAL 15.11.1941. Embarked in H.M.S. ARGUS 27.02.1942. Disembarked from H.M.S. ARGUS 01.04--21.05.1942. Disembarked from H.M.S. ARGUS 07.06.1042. Embarked in H.M.S. EAGLE 12.07.1942. Disembarked from H.M.S. EAGLE 17.07.1942. Embarked in H.M.S. ARGUS 18.07.42. Moved here from RNAS Machrihanish 25.10.1942. Embarked in H.M.S. FURIOUS 30.10.1942. Disembarked from H.M.S. INDOMITABLE 23.06-10.07.1943. Disembarked from H.M.S. INDOMITABLE 29.07.1943. Embarked in H.M.S. BATTLER 14.08.1943. 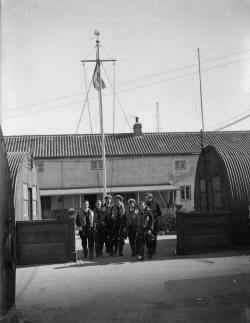 Detachment (7) disembarked from H.M.S. HUNTER 24.05.-07.06.1944. Detachment (4) disembarked from H.M.S. HUNTER 06-12.06.1944. Detachment (6) disembarked from H.M.S. HUNTER 27.06.-21.07.1944. Detachment (?) disembarked from H.M.S. ARK ROYAL 20.06-05.07.1960. Disembarked from H.M.S. HUNTER 23.09-01.10.1943. Detachment (?) disembarked from H.M.S. STALKER 24.05-05.06.1944. Detachment (12) disembarked from H.M.S. STALKER 17-21.07.1944. Disembarked from H.M.S. EAGLE 20.02.1054. Moved to RNAS Culdrose 28.03.1954. Detachment (6) disembarked from H.M.S. ARK ROYAL 18-28.02.1977. Detachment (4) disembarked from H.M.S. ARK ROYAL 28.04.-05.05.1941. Moved here from RNAS Culdrose 06.06.1959. Embarked in H.M.S. CENTAUR 08.06.1959. Equipped with Sea Hawk FGA.6 (CENTAUR). Detachment (2) disembarked from H.M.S. BITER 25.02-02.03.1944. Equipped with Swordfish II and Wildcat IV. Disembarked from H.M.S. FURIOUS 07.09.1941 Embarked in H.M.S. ARK ROYAL 10.09.1941. Disembarked from H.M.S. ARK ROYAL 01.10-10.11.1941. Disembarked from H.M.S. ARK ROYAL 15.11.1941. Embarked in H.M.S. ARGUS 16.11.1941. Disembarked from H.M.S. ARGUS 27.11.1941 - 27.01.1942. Disembarked from H.M.S. EAGLE 08.03-17.05.1942. Disembarked from H.M.S. EAGLE 16.06.1942. Embarked in H.M.S. ILLUSTRIOUS & S.S. LANCASHIRE (no a/c) 04.10.1942. Detachment (2) disembarked from H.M.S. EAGLE 23-24.08.1955. Equipped with 9 Swordfish I & 2 Sea Hurricane Ib.. Equipped with Wyvern S.4 (1955). Disembarked from H.M.S. EAGLE 03-13.02.1959. Equipped with Gannet AS.4 (EAGLE). Equipped with Whirlwind HAS.7 HERMES). Equipped with Sea King HAS.2 (BULWARK). Detachment (4) disembarked from H.M.S. EAGLE 19-22 & 26-29..03.1954. Detachment (4) from RNAS Culdrose 23.08-08.09.1955. Disembarked from H.M.S. INDOMITABLE 20.07.1943 - squadron non-operational from 01.09.1943, aircrew dispersed. Disembarked from H.M.S. ARK ROYAL 07-28.01.1941. Disembarked from H.M.S. ARK ROYAL 01.16-28.04.1941. Disembarked from H.M.S. FORMIDABLE 12.02.1943 Moved to La Senia 16.02.1943. Equipped with Swordfish I (ARK ROYAL). Equipped with Albacore I (FORMIDABLE). Equipped with 4 Wessex HAS.3 (BLAKE). Equipped with Sea King HAS.5 (INVINCIBLE). Disembarked from H.M.S. ARGUS 29.12.1940. Embarked in H.M.S. ARK ROYAL 31.12.1940. Equipped with 6 Swordfish I .
Disembarked from H.M.S. EAGLE 24.02.1040. 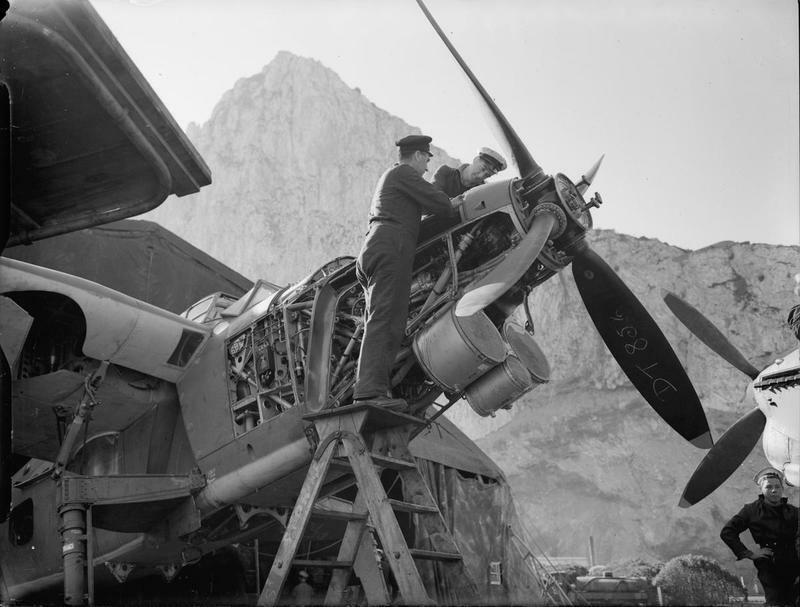 Detachments operated in ARGUS and EAGLE - when EAGLE was sunk in August 1940 remnants of squadron disbanded into 813 Squadron. .Disembarked from H.M.S. EAGLE 13.03.1959. Moved to RNAS Culdrose 20.03.1959. Detachment (4) disembarked from H.M.S. ARK ROYAL 22.06-04.07.1960. Disembarked from H.M.S. CENTAUR 29.08-19.09.1962. 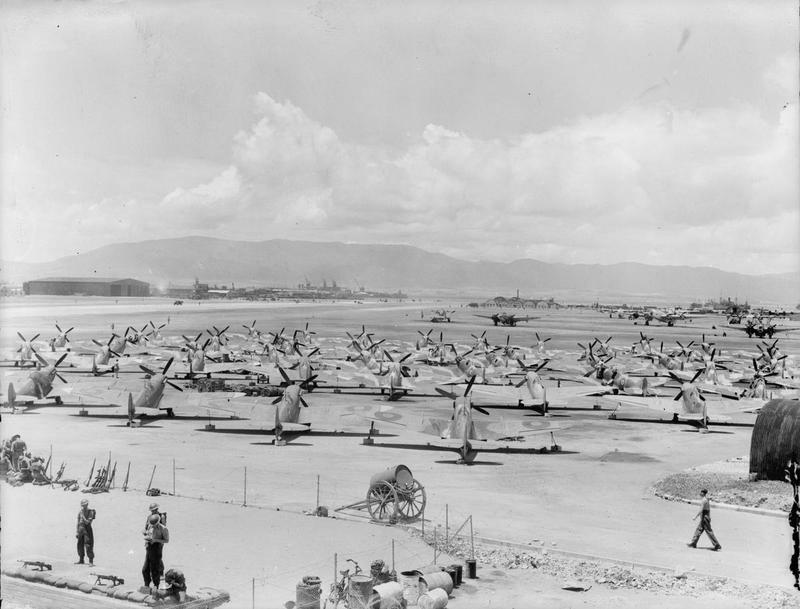 Detachment (1) disembarked from R.F.A. OLNA 09-29.01.1977. Equipped with Avenger AS.4 (Lee-0nSolent). Equipped with Whirlwind HAS.7 (Eagle/Culdrose/ARK ROYAL/CENTAUR). Equipped with Sea King HAS.1 (OLNA). Disembarked from R.F.A. OLNA 26.02-26.03.1972. Disembarked from R.F.A. OLWEN 12-23.04.1983. Equipped with Sea King HAS.2 (OLNA). Equipped with Sea King HAS.5 (OLWEN). Disembarked from H.M.S. INDOMITABLE 07.02-03.03.1952. Moved here from RNAS Hal Far 22.08.1955. moved to Le Boirget09.09.1955 on route to RNAS Lee-on-Solent. Disembarked from H.M.S. HERMES 06-20.02.1967. Detachment (3) disembarked from R.F.A ENGADINE 14-18.06.1976. Equipped with Gannet AS.1 (Hal Far). Equipped with Wessex HAS.1 (HERMES). Equipped with Sea King HAS.1 (ENGADINE). 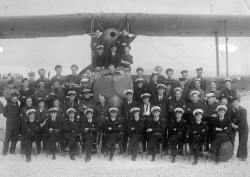 Personnel of 700 (Gibraltar) squadron - with one of their 6 Walrus aircraft. Photo: Courtesy of Peter Langsdale whose father RAF Flight Sergeant CFW Langsdale, the only member of the RAF on the unit, he is pictured leaning against the aircraft's nose row. Hello... I an an Admin on a Gibraltar Old photos group on Facebook and shared some of your great photos (with a link back to this page of course). One of our members posed the following question regarding the photo of the station's map & layout: "I believe the current markings are 09 and 27, not 10 and 28." Any idea what the answer is? I thought this may have been the RNAS's own designated markings for it... but perhaps you can clarify?